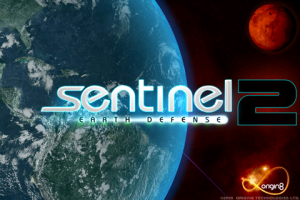 ‘Sentinel 2: Earth Defense’ – Does It Live Up to the Original? There’s no question that Origin 8 had a hit on their hands with the original Sentinel: Mars Defense [App Store], a game that firmly held the title of my favorite tower defense game for a very long time. Originally pitting players against a savage alien onslaught on the surface of Mars, Sentinel 2: Earth Defense [App Store] brings the fight home. A brief text introduction explains that despite your best efforts, the defense of Mars failed. Your drop ship, Sentinel, received a massive arms upgrade, and now you’re forced to defend Earth. While not exactly a riveting plot, it gets the job done. So, with that out of the way, prior to the release of Sentinel 2, I thought Sentinel was one of the best tower defense games on the App Store. 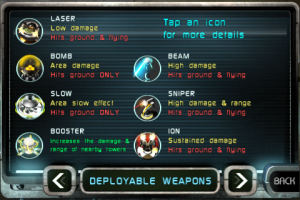 The graphics were superb, the music was well done, the game performed great on my iPhone 3G (even while using the fast forward mode), but best of all, Origin 8 really nailed it with the balancing of the game. The difficulty levels included made the game accessible for a wide spectrum of gamers, where “easy" was hard to fail and “psycho" left even tower defense experts scratching their heads looking for ways to refine their build outs to survive through the waves of beefed up creeps. Along with the standard array of direct damage, ranged, slowing, and area effect towers, Sentinel also featured an Ion tower which created a patch of red ion fire that caused sustained damage to anything that walked through it. The most difficult decision to make however was when to deploy drones. At $150, drones were expensive at the beginning of each map, but slowly gathered additional resources to make them a very worthwhile investment over time. However, deploying drones too early could leave you cash-starved and unable to build the towers required to survive through the next few waves of creeps. Each map also featured different temporary barriers that the creeps could destroy that served as bottlenecks to build your initial defenses. Each of these barriers generally had very few hit points, which when damaged invoked the secondary fuction of the drones, repairing. All of these things together created a very refined gameplay experience that (especially in harder difficulty levels) made for a very technical game that really reminded me of all the time I had spent in the past doing things like tweaking Magic: The Gathering decks or trying to shave precious seconds off my Warcraft 3 or StarCraft builds. Or, on easier difficulties was just a fun, simple, and well done game. With some extremely large shoes to fill, does Sentinel 2 live up to the original? In my opinion, a resounding yes. Sentinel 2 expands on the winning formula of Sentinel and provides some additional gameplay elements not found in the original. 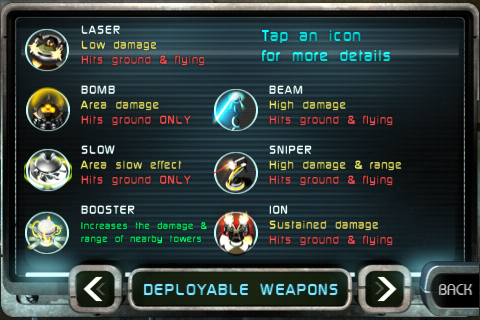 The largest feature addition is that of your drop ship’s newly upgraded weaponry. Each map has a destructible barrier that also serves as an energy generator. A tiny bit of energy is generated each round, which allows you to activate one of four devastating ship weapons when enough is stored. 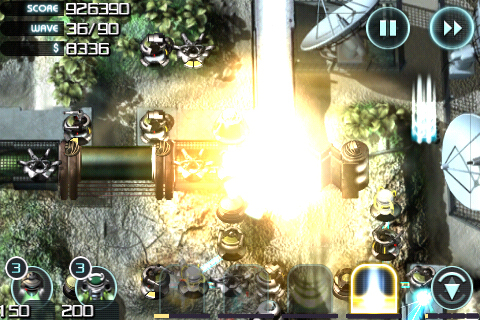 Homing missiles launches a barrage of missiles that target the creeps on screen, and when attack drones are deployed, three drones briefly appear on screen and go to town shooting things up with their lasers. The two even stronger ship weapons are area effect attacks that are aimed by dragging the targeting reticule that appears on screen when they are activated. 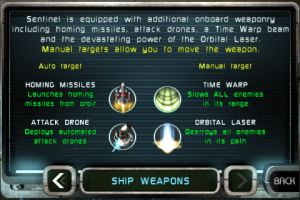 The time warp attack slows all enemies inside of the beam, and the orbital laser destroys anything it touches. Along with your ship’s upgraded weaponry is a second set of drones, which harvest energy at an increased rate. Now you can have three repair drones to gather resources to turn in to cash and repair your barriers, as well as three energy drones to power up your weaponry faster. Also, in addition to the same set of towers from the original, Sentinel 2 features a Booster tower that increases the damage and range of all the nearby towers. The combination of all these new features add yet another layer of strategy on top of an already detailed tower defense game. The best part? There doesn’t really seem to be any “right" way to build your defenses most of the time. Going straight for towers that are fully upgraded with Booster towers deployed, focusing on repair drones, or prioritizing energy drones and using your ship weapons more often all have seemed to be perfectly viable defense strategies if each method is utilized properly. Like the original, Sentinel 2 has four maps, each playable in four different difficulty levels. Once Assault mode is completed on a map, Endurance mode is unlocked which allows you to endlessly fortify your defense to see how many waves you can survive. However, something new in the sequel is the addition of Mission mode. 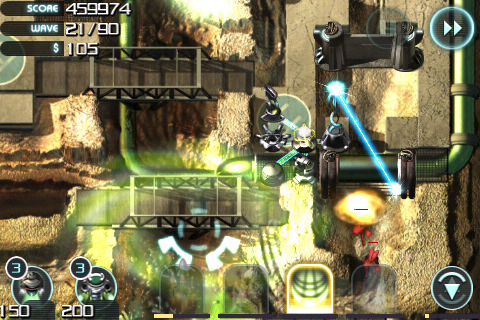 Ten missions, each increasing in difficulty challenge players to complete objectives such as surviving through waves of creeps by only using ship weaponry, build defenses with limited resources, as well as different scoring and time-based goals. I actually would recommend players try to make it through the missions before starting in on assault or endless modes because they serve as a great tutorial for some of the strategy required to do well at higher difficulty levels. The music in Sentinel 2 is just as good as the original, with exclusive tracks written by Specimen A and this time around Origin 8 added full OpenFeint support allowing for online leaderboards, achievements, friends lists and chat shared amongst all other OpenFeint-enabled games. If you happen to be new to the tower defense genre, Sentinel is a great place to start, especially with the current price of 99¢. Since Sentinel 2 is an evolution of the original, if you enjoy the first, you will enjoy the sequel. Both are among my favorite games, and while there is no shortage of tower defense games for the iPhone, in my opinion, both Sentinel games are among the best the App Store has to offer.